Last week I was stunned to receive a tweet from Lindsay Walsh of Standing Armed. 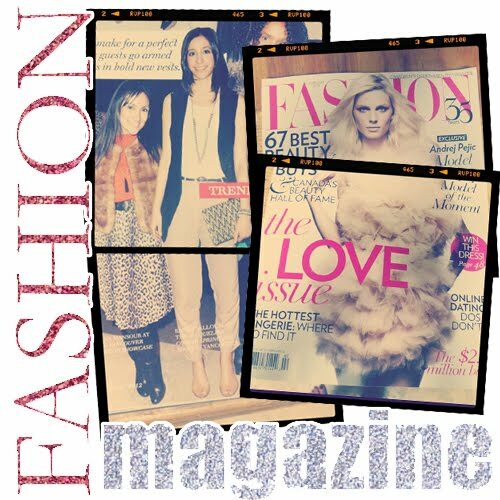 She enthusiastically tweeted "@RandaSalloum Saw you looking stunning in the Feb issue of @FashionCanada!" My initial reaction, I will admit was "What tha fak!" and then quickly turned into "OH EM GEE!" when I clicked through the digital pages online. Finding myself in an issue of one of my favorite fashion magazines is a bit surreal and totes exciting! Thank you to the editors at Fashion Magazine and a big thank you to Peter Jensen for the photograph! To look through the digital pages of Fashion Magazine click HERE. If you read my blog you know that I'm currently doing an overhaul of my beauty routines and finding ones that fit me perfectly. I've noticed that I have my definite go-to essentials that I use on a daily basis but for different looks and feels. Here are a few from last week. What are your beauty essentials? Share with me! Like my photos? Follow me on Instagram (the unprecedented) & Followgrame HERE.